The PCB-REZ is a breakthrough in patient care technology! The REZ Easy-Glide System allows a caregiver - regardless of strength and size - the ability to glide a patient gently toward and away from atable with the press of a toe! How it works: Positioned behind a seated patient, a caregiver presses a toe on the non-slip pad of the PCB-REZ Easy Glide and applies weight. The Easy-Glide elevated caster system lowers to meet the floor and allows the chair to move forward or back. It's that easy! Save time, retain patient dignitiy, and avoid costly caregiver injuries with the PCB-REZ Easy-Glide System! Your staff and patients will feel like royalty! 2. Chair Cavity: Ideally the chair cavity….space underneath the chair, should be clean with no obstructions. If the chair has a stretcher bar, placed right to left between the chair legs, it must be positioned at least 6” above the floor. 3. Leg Dimensions: The dimensions of each chair leg shall measures at least 1” x 1.25”. *** Note that ornate leg designs can interfere with proper installation regardless of the above criteria. if in doubt, send us a photo of your chair. 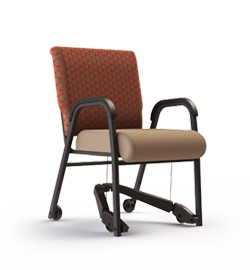 MIGHTY 300lbs capacity The PCB-REZ allows a Caregiver to gently move a seated person to and away from a table. Easily moves 300lbs with very little effort. So easy a child can do it! 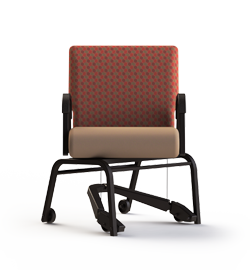 Tension adjusted rear wheels prevent chair movement when not in use. Anti-Slip Pedal for safe operation. Strong safety cords keep the REZ elevated when not in use.